Surfing has become a new growing scene for Koreans in recent years. It is a sport or hobby more and more Koreans are eager to give a try amid the sweltering heat. Only a decade ago, hitting the waves on a surfboard would have been considered bizarre to many locals. “If you searched for ‘surfing’ on the internet, the only results you would have gotten were either ‘wind surfing’ or ‘surfing the web’ 10 years back,” Lee Hyung-joo said in an interview with The Korea Herald. Dressed in blue shorts and a Jack Daniels tank top, Lee, 34, instantly conjured up the image of a stereotypical “surfer dude” with his short beard, sun-kissed skin and mellow personality. There is more to Lee than meets the eye, however. Under the vision to instill the same level of enthusiasm for the sport to Koreans, the business owner showed relentlessness in obtaining the permit to open his “surfers’ haven,” as he and his partners ran from meeting to meeting with county, village and military officials. 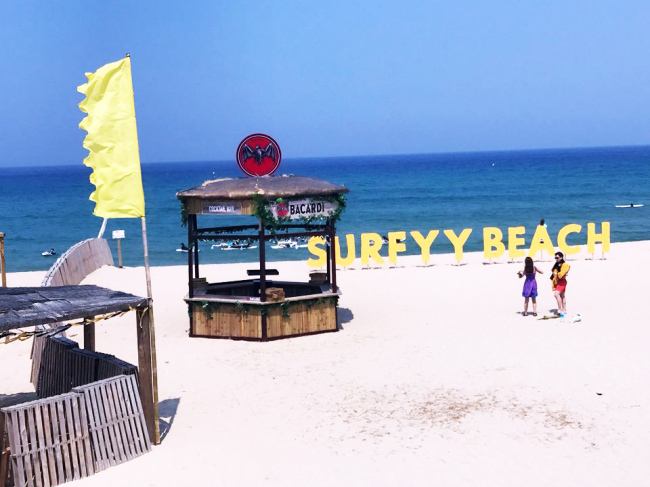 Located near the beautiful Hajodae Beach, Surfyy Beach is a surfers-only beach that opened in Yangyang-gun, Gangwon Province, 155 kilometers east of Seoul, in July 2015. The area had been closed off to the public until then. 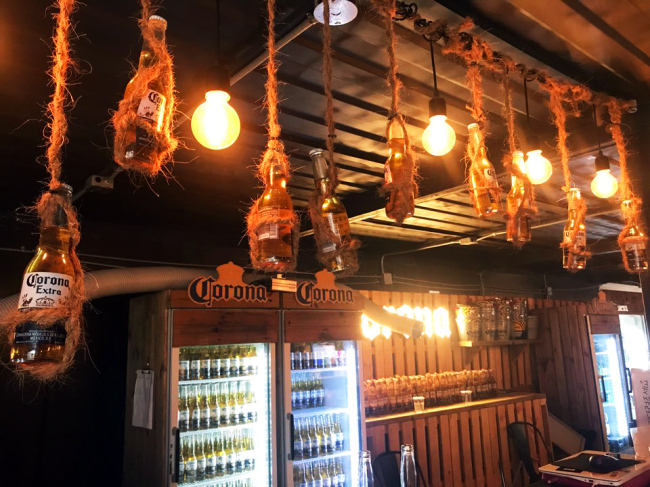 With rope-tied corona bottles hanging from the ceiling, the beachside bar casts an ambience similar to that of Spain’s Ibiza or Mexico’s Cancun. Neon surfboards, disco balls and a handmade dream catcher all make the space inviting for surfers to relax and enjoy a cold beer. Boasting some 50 instructors on scene, the surfers’ paradise offers group lessons and gear rental by day and a party scene by night. Through lessons, beginners get to learn the basics of surfing from paddling to catching the wave. 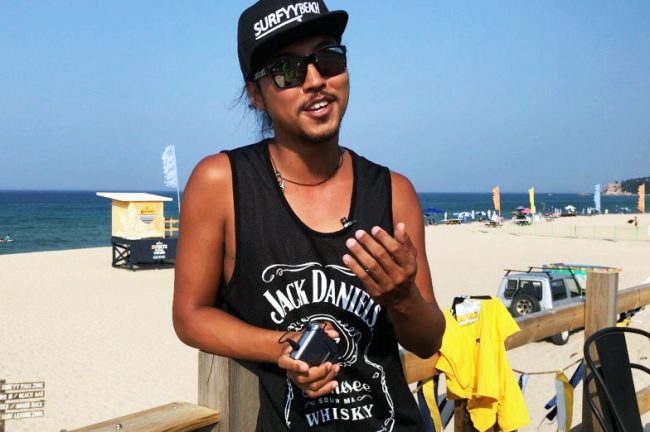 “Korea’s own surf culture is very distinct from that of other countries. Because Korea’s surf history goes back maybe only six years, the community is quite open to changes. The community is comprised more of people who embrace or envy the perceived ‘laid-back’ surfer culture,” Lee explained. Another instructor surnamed Park, 24, agreed with Lee regarding the types of people who stroll onto the beach and sign up for classes. “People come here more to relax and enjoy each other’s company by the beach. Not everyone who surfs in Korea checks their phones for beach cams, wind forecasts and wave finders like us who wake up in the early morning when the waves are best,” Park said. 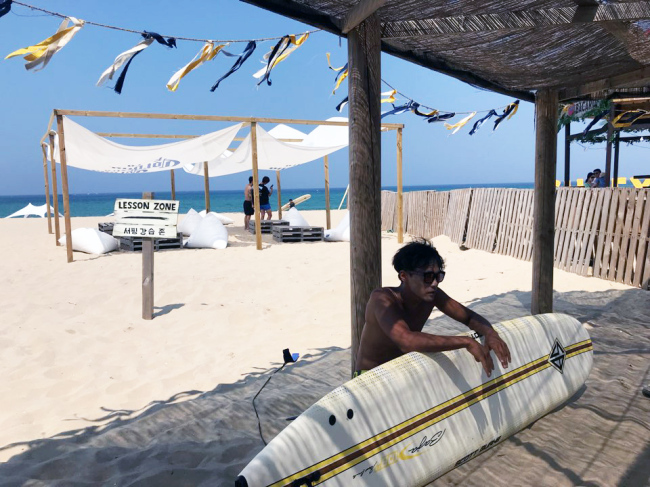 Similar to Park, Sung Chul-jun, 28, has only one year of experience in surfing, but has a growing appetite for catching the waves and finding the best swells. “My friends and I decided to take a drive to Yangyang’s Jukdo Beach last summer. When we got there, it seemed everyone was trying out surfing. I used to hate going near water, but surfing helped me overcome my aquaphobia,” Sung said. The feeling of being in full control on top of the board while wielding one’s way across the water is just exhilarating, according to Sung. Asked about future plans regarding surfing, the graduate student in arts and design hopes to travel to neighboring countries like Singapore and Indonesia where the waves are much bigger than local beaches. According to Lee and Park, surfers like to constantly be on the move in search of the cleanest and largest swells. Given this characteristic, David Kim, 39, shared a time when he got on a plane to Hawaii five years ago to surf. “Surfing is such an appealing sport that your athletic friend keeps telling you to try. Hitting the beaches in Hawaii on my surfboard was just amazing,” he exclaimed. The number of people jumping on the surfing bandwagon has been swelling, with many locals pointing out the sport’s high accessibility. Park Hae-na, 34 and an office worker in Seoul, thinks surfing is relatively cheaper than other water sports. As a sports maniac, Park has tried all kinds of water sports, including but not limited to wakeboarding and flyboarding. Compared to other water sports, surfing helps her feel more connected to nature. The sport is a good way to get away for the weekend and de-stress, she added.